Scripture is not merely to be learned, but to be lived – a truth that every translator of scripture needs to constantly remember. Getting scriptural translation right means to convey scripture’s literal meaning accurately in the translated language. Getting it across means conveying the essential point intelligibly and appealingly so that scripture speaks to readers in the translated language as relevantly as it spoke in its native language to its original readers. An excellent example of such a living translation is Srila Prabhupada’s rendition of the Bhagavad-gita (15.06). The text states that Krishna’s abode, the spiritual world, is not illumined by the sun, moon or fire. In his translation, Srila Prabhupada adds electricity to the list. Is this addition justified? Let’s consider how well it conveys the essential meaning. The verse’s main point is that the spiritual world is self-luminous, not requiring any source of illumination. Thus that world contrasts with this material world, which is an inherently dark place in need of illumination. This purpose of contrasting becomes evident later (15.12) when Krishna lists the same three sources as his manifestations for illuminating this world. Srila Prabhupada translated the Gita primarily for modern urban audiences whose most familiar source of illumination was electricity. So, for impressing on them the point of the spiritual world’s self-luminosity, his addition of electricity to the list is not just appropriate but also astute. The addition expresses the text’s import tellingly for its readers. A translation that is linguistically precise but practically irrelevant is a dead translation. 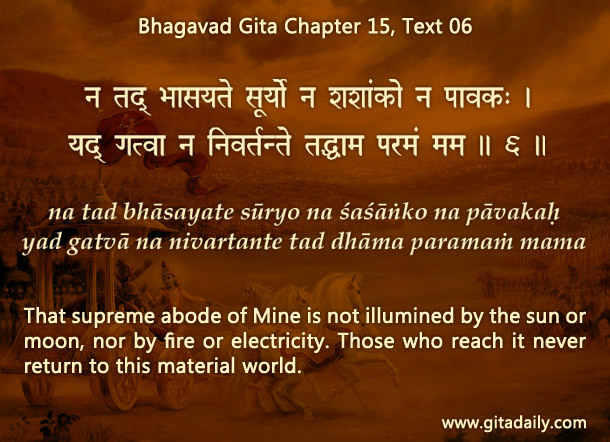 Those who live the Gita can’t tolerate offering such fossilized translations – they strive to offer the living text as they live it and as their audience can live it. Such are the translations that keep the Gita alive and bring its readers spiritually alive.